American Patchwork & Quilts magazine is one of the signature crafts magazines from Meredith Corporation the publishers of Better Homes and Gardens. 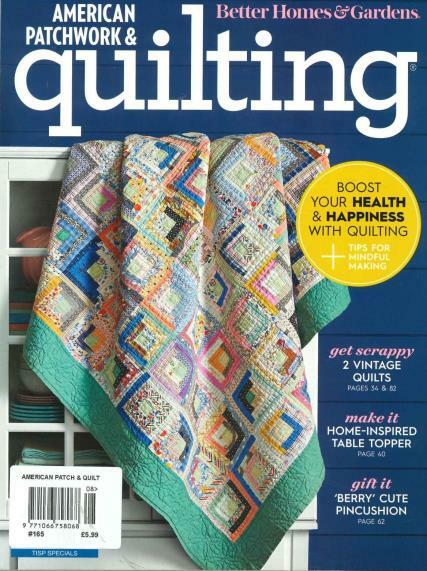 Buy a single copy or subscription to American Patchwork & Quilting magazine. This is quilting information and news for the beginning quilter and for the advanced in quilting techniques. The magazine comes with quilting tips from experts, news on must have products for quilters, and loads of photographs of quilts and quilt designs to inspire. There is even a free full size pull out quilt pattern in every issue. Every issue contains tested quilt projects, and feature articles to motivate and inform. There are quilting projects for all kinds of things like the one of a kind bag discussed in recent article called ‘Bit by Bit’. Read profiles of quilters and textile artists like Malka Dubrawsky who utilizes a free form style to make artistic bold contemporary fabric designs. Learn how to use stunning solids and large designs for a more modern day look in quilts. Maybe you would like to try your hand at miniature quilts for a doll house or completely redo your bedroom with a new quilted bedroom ensemble. Learn from the pros how to pick colors for your quilts with confidence.